The fall colors are some of my favorite seasonal colors. Not sure why, but I just tend to love the beautiful colors that nature creates at this time of year. And because of that, I always tend to purchase a few balls of fall colored yarn. And this year I bought this red and light brown yarn, which was enough for a hat and some fingerless gloves. The glove pattern will be published in a few weeks from now because it still needs testing and I’ve got so many projects on the go again it’s not even funny. Fall is almost over here. The leaves have pretty much fallen off the trees, but I’m still going to wear this hat. Although they are fall colors, when I took the picture I realized that these colors would be great for Christmas as well! The hat pattern is given to fit an adult small or teen size. However, it is very easy to adjust in size and can be crocheted to fit a baby, toddler, child or extra large adult. Gauge: 2.5″ across first 3 rounds. Finished Size: Measures 9″ across when laying flat. However, it can be increased to any size. When you do your first cross-over long dc in the round, make sure that you work it into the last st made in previous rnd and NOT into the joining sl st. You might find it helpful to mark your last st in the round before you make your join. All rounds, except for the back post stitches, are crocheted in back loops only. All rounds are joined in both loops. Rnd 1: Work 8 hdc in 2nd ch from hook; join with sl st in first hdc. Continue with increases until desired diameter. Rnd 3: With CB, Ch 1, sc in same st as join and into each st around; join with sl st in first sc. Rnd 5: With CA, Ch 1, sc in same st as join and into each st around; join with sl st in first sc. Rnd 6: With CA, Ch 1, bpsc in same st as join and into each st around; join with sl st in first bpsc. Rnds 7-14: Rep rnds 3-6. Rnd 15: Rep rnd 5. FO. To make a matching cowl, ch any multiple of 4. Join the chains with a slip stitch and follow instructions given for the Side of Beanie, starting at rnd 1. For me about 80 chains is a good length to go around once. For one that wraps I would say to start with around 160 to 200 or more. 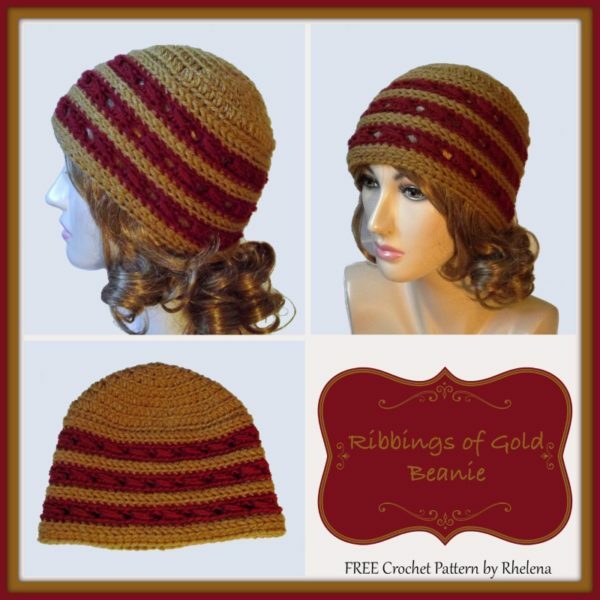 Why do we have to go through hell and back to get a “free Pattern” of the gold ribbed hat? After wrestling with it for 1/2 hour – I give up. Joyce, Would you mind being more specific as to what problems you’re having? There is a download button underneath the main image, which should give you a clean pdf file. You can also use the print-friendly button at the bottom, which sometimes causes issues, but that is beyond my control. If none of those work, copy and paste the text into Word or Notepad.